North Dakota State 37 - Minnesota 24. Minnesota is hardly even worth talking about. This is, almost without question, the worst D-I program in the country. After playing the murderers' row of USC, New Mexico State, Miami (OH), and North Dakota State, Minnesota is 1-3 and ranks 102nd in pass efficiency defense, 33rd (?) in rushing defense, 102nd in pass efficiency, 44th in rushing per game, and 75th in scoring. They have played basically no one and have been a total black hole doing so. Against NDSU, Minnesota was outgained by 44 yards, putting up a measly 292 yards of offense. Their two quarterbacks combined to throw 9/20 for 124 yards (6.2 YPA) and two interceptions. The defense allowed NDSU to rush for 5.0 YPC on 28 attempts and generously offered 9.4 YPA through the air. This was an all-out shellacking at the hands of an FCS team that ranks in most categories somewhere around 30th best FCS program. San Diego State 7 - Michigan 28. Game recap. Last week, Michigan thoroughly dominated Brady Hoke's old stomping ground San Diego State. It didn't hurt that linebacker-sized quarterback Ryan Lindley was awful. Lindley was 23/48 and averaged 5.3 YPA. Star running back Ronnie Hillman ran well (5.2 YPA on 21 carries) but fumbled twice. The rest of the SDSU offense spent the game dropping passes or getting bulldozed by Mike Martin. It was a convincing defensive effort. On the other side of the ball, Denard had another rough day, completing only 8 of his 17 passes for 93yards and 2 interceptions. He did, however, run all over the tiny SDSU defense (200 yards on 21 carries). Fitz Toussaint and Vincent Smith battled back and forth with highlight carries and the receivers all turned in their usual performance. The Minny rushing defense appears to be at least functional. They currently rank 33rd in rushing yards per game allowed. 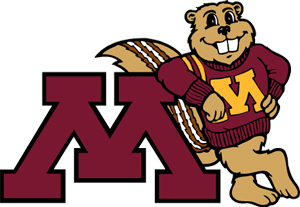 However, with a secondary as porous as Minnesota's, any time a team runs against them, it's a win for the Gophers. Expect that number to drop significantly when Denard comes to town and turns the secondary into stone pillars as he dashes by them to the endzone. If Michigan punts more than twice in this game, it will be a failure. There should be virtually no resistance. Offensively, Minnesota uses option packages with quarterback Marqueis Gray, who is reportedly questionable for the game on Saturday. Through the air, Gray has completed 39 of 77 attempts for 6.8 YPA, 3 TDs, and 3 INTs, otherwise known as Threetidan+. On the ground, he has been marginally better, carrying the ball 71 times through the first four games for 351 yards (4.9 YPC). If Gray can't go, freshman Max Shortell* gets the lucky task of going against Walk-On Ray Lewis and Mattison's wonky blitzing schemes. Shortell has seen spot action this season, completing 13 of the only 28 passes he's thrown with 2 TDs and 2 INTs. He is a 6'6" lankmonster that isn't going to do any damage with his legs. Watching him throw against Michigan's zone blitzes should be Bauserman-esque. Despite being an option offense, the Gophers are not very intimidating on the ground. That could be because their offensive line two-deep is made up primarily of freshmen. Gray is the team's leading rusher with 351 yards and zero TDs. He's followed by fifth-year senior Duane Bennett who is averaging a hilarious 3.7 YPC on 44 carries. If Gray is able to play on Saturday, the key will be for the linebackers/DEs to keep the edge and force the run back inside. If Shortell plays, the key will be not dropping hilariously thrown interceptions. Either way, this is another chance for Michigan's defense to pad their stats. *Shortell's high school highlight films appear to be video of him throwing into double coverage and having his passes batted down. -10 points for lack of music. -25 for not using Rick Ross' "Hustlin". Have you seen this Minnesota team play? Denard throws a pick. Denard runs for over 150 yards. Devin Gardner sees his first "meaningful" snaps. The defense wins the turnover battle by at least 3. Well, you've been right in your picks, but you continue to be woefully off in your score predictions. 58-0 is a far cry from your 45-16. Our defense is looking more and more real... Okay, so Minnesota was really terrible, but I mean, 58 to ZERO... yeow!